Across the street from Sunset Memorial Gardens. Billings Cemetery was at Central Ave and Mervin St. 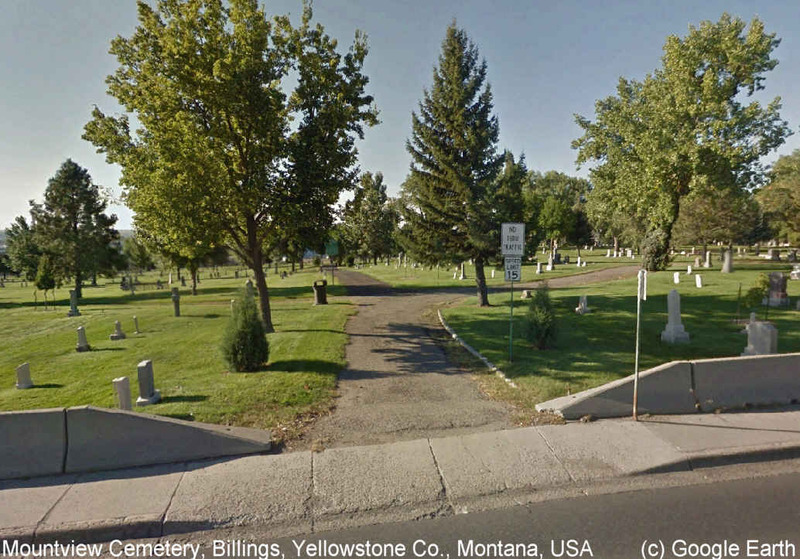 But it was bought by the City of Billings and merged with Mountview Cemetery in 1926. And Mervin Street has not gone through to Central Ave since the 1960s or earlier. Mountview Cemetery together with the adjacent Billings Cemetery is the largest and oldest continually operated cemetery in the region. It has a history that is visually represented by the historical stones dating back to the early 1880's. Most of the founding fathers of Billings are buried in either the Billings or Mountview Cemetery. Billings Cemetery was started in approximately 1882 by the O'Donnell family and operated by them until the City bought it in 1926. Edward O'Donnell was the first superintendent of the cemetery followed by James O'Donnell, his son, when he returned from WWI. The Billings Cemetery is visually different in appearance by its widely diversified stones. In 1920, the City fathers purchased land adjacent to the Billings Cemetery and started the Mountview Cemetery. James O'Donnell was the first superintendent to live in the cemetery house and operated the cemetery until he retired at the end of 1959 after working for 41 years. Arnold "Bud" Kautsky was the next superintendent, followed by LeRoy "Stew" Stewart. Stew was the last superintendent to live on the cemetery grounds and was the third longest on the job with 25 years. Lee Stadtmiller is the current superintendent and started in 2000. In 1952, the cemetery bought land adjacent to the cemetery for future use. It remains to be seen, but the agreement was that when the cemetery needs it, the Par Three Golf Course will revert back to cemetery use. Even so, there is enough land at the current levels of use to sell graves for another 60 years and people will be buried here well into the twenty-second century.